These rustic, heart-shaped soap party favors will make an awesome addition to any wedding or party! 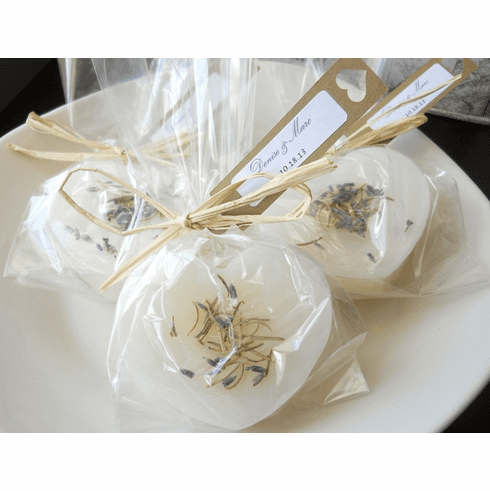 They are adorned with lavender buds and rosemary leaves for a beautiful touch. These soaps come inside a high quality clear cellophane bag and are decorated with a natural raffia bow and a kraft cardstock heart tag. Please let me know what color of soap you want. If you would like to add a few words (no more than 6-8, these tags are a bit smaller than our usual tags) to commemorate the occasion, please let me know in the comments section at checkout. They will weigh between 2-2.5 ounces each. Please let me know at checkout what scent you would like your soap. IF YOU DON'T SEE A COLOR OR SCENT YOU LIKE-PLEASE LET ME KNOW AND I CAN CUSTOMIZE THAT FOR YOU. Depending on the size of your order, lead time will be about 7-9 days to complete. Due to the nature of the product and because these are made-to-order, we do not accept returns on these. We do take rush orders, but email or call first to see if I can accommodate your needs. I don't charge extra for this because I always I try to be as flexible with my customers as I can. Depending on the situation, you may have to pay a little extra for any rush shipping fees that USPS may charge. NOTE: All custom orders, wholesale orders, party favors, and gifts baskets are made-to-order so once your order is placed, I get to work on it. Because of this, order cancellations or returns will not be accepted on these types of orders.